Catherine Cho's orchestral engagements have included performances with the Detroit and National Symphony orchestras, the Buffalo Philharmonic and Virginia Symphony, the Montreal, Edmonton, and National Arts Centre Orchestras in Canada, the Korean Broadcasting Symphony, the Barcelona Symphony, the Het Gelders Orkest in Holland, the Orchestra of the Teatro Colon in Buenos Aires, the New Zealand Symphony Orchestra, and the Aspen Chamber Symphony. She has performed with the symphony orchestras of La Coruna and Mallorca in Spain; Caracas, Venezuela; and Daejon, Korea. Ms. Cho has toured Israel with the Haifa Symphony, and was the soloist on a concert tour in Japan and Korea with the Juilliard Orchestra and Hugh Wolff conducting. In 2002, she appeared as a special guest soloist with the New York City Ballet at Lincoln Center for two ballets by renowned choreographer Peter Martins including the New York premiere of his ballet Viva Verdi. A regular guest on tour with "Musicians from Marlboro", Ms. Cho has also been a participant in their summer Music Festival in Vermont since 1993. In January 1999 she appeared as soloist with the Jeunesse Musicale World Orchestra including a concert at the Berlin Philharmonie Hall, and was immediately re-invited to be the soloist for a special New York concert at Riverside Church during the orchestra's North American concert tour in August 1999. Her collaborations with distinguished conductors include Mstislav Rostropovich, Robert Spano, Sixten Ehrling, Franz-Paul Decker, and Hugh Wolff. In broadcasts heard around the world, Catherine Cho has appeared on such stations as Radio Frankfurt (Germany), CBC (Canada), WQXR (New York City), and National Public Radio. Ms. Cho's concert performance of Vivaldi's Four Seasons in December 2000, with the Buffalo Philharmonic under the baton of Jo-Ann Falletta, was taped live and broadcast nationwide on PBS in January 2002. Her live recording of the Vivaldi Four Seasons with the Korean Chamber Ensemble was released in June 2003. She has also recorded works by Harbison, Lerdahl, and Moravec for Bridge Records. As a recitalist and chamber musician, Catherine Cho has performed on the prestigious stages of Alice Tully Hall with the Chamber Music Society at New York's Lincoln Center, the Mozarteum in Salzburg, the Casals Hall in Tokyo, the Kennedy Center for the Performing Arts in Washington, D.C., the New York Metropolitan Museum of Art and the 92nd St. "Y", the Isabella Stewart Gardner Museum of Boston, and on Ravinia's "Rising Stars" series in Chicago. In 2003, Ms. Cho opened the season in Seoul, Korea with performances of the complete cycle of Beethoven's violin sonatas. She has appeared at the Aspen and Marlboro music festivals, as well as Chamber Music Northwest, Bridgehampton, Eastern Shore, Rockport, Skaneateles, and Santa Fe Chamber Music Festivals. She has participated in eleven Music from Marlboro tours, and is a founding member of the chamber ensemble, La Fenice. She was a member of the Johannes String Quartet from 2003-6. Among her various awards, scholarships, and achievements, Ms. Cho was a recipient of both the 1995 Avery Fisher Career Grant designed to recognize outstanding American instrumentalists who exhibit strong potential for solo careers, and Korea's 1995 World Leaders of Tomorrow Award as presented by the Korea Central Daily News in recognition of outstanding achievement and commendable leadership in the Arts. She was the recipient of the 1994 Sony ES Award for Musical Excellence; a top prize winner at the 1991 Hannover International Violin Competition, the 1989 Queen Elizabeth Music Competition of Belgium, the 1987 Montreal International Music Competition; and a 1988 Presidential Scholar in the Arts. In 1995, Catherine Cho served on the jury of the Montreal International Violin Competition. In 1996, she was selected for the Janet and Avery Fisher Music Residency Program at Goucher College. Ms. Cho holds a Masters Degree from the Juilliard School where she studied with Dorothy DeLay and Hyo Kang, and coached chamber music with Felix Galimir. Her former teachers include Ruggiero Ricci, Franco Gulli, and Michael Avsharian. 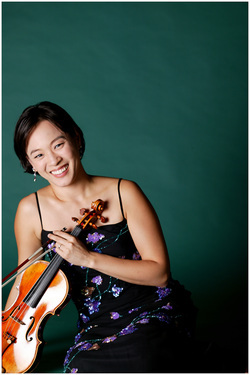 Now a member of the violin and chamber music faculty at the Juilliard School, Ms. Cho has also taught at the Starling-DeLay Symposium, Heifetz Institute, New York String Seminar, Seoul Music Festival and Academy, and the Perlman Music Program. Devoted to the cause of promoting peace through music, Catherine Cho is VP of the Board of Musicians For Harmony. Born in Ann Arbor, Michigan, Catherine Cho gave her first public performance at the age of four, and made her official concert debut at age eleven with the Tivoli Symphony Orchestra in Copenhagen, Denmark. She currently resides in Brooklyn, NY with her husband, Todd Phillips, and their son, Brandon.